A Mycenaean Greek reference to a deity or semi-deity called ti-ri-se-ro-e (Linear B: 𐀴𐀪𐀮𐀫𐀁; Tris Hḗrōs, "thrice or triple hero") was found on two Linear B clay tablets at Pylos and could be connected to the later epithet "thrice great", Trismegistos, applied to Hermes/Thoth. On the aforementioned PY Tn 316 tablet—as well as other Linear B tablets found in Pylos, Knossos, and Thebes—there appears the name of the deity "Hermes" as e-ma-ha (Linear B: 𐀁𐀔𐁀), but not in any apparent connection with the "Trisheros". This interpretation of poorly understood Mycenaean material is disputed, since Hermes Trismegistus is not referenced in any of the copious sources before he emerges in Hellenistic Egypt. Cicero enumerates several deities referred to as "Hermes": a "fourth Mercury (Hermes) was the son of the Nile, whose name may not be spoken by the Egyptians"; and "the fifth, who is worshiped by the people of Pheneus [in Arcadia], is said to have killed Argus Panoptes, and for this reason to have fled to Egypt, and to have given the Egyptians their laws and alphabet: he it is whom the Egyptians call Theyt". The most likely interpretation of this passage is as two variants on the same syncretism of Greek Hermes and Egyptian Thoth (or sometimes other gods): the fourth (where Hermes turns out "actually" to have been a "son of the Nile," i.e. a native god) being viewed from the Egyptian perspective, the fifth (who went from Greece to Egypt) being viewed from the Greek-Arcadian perspective. Both of these early references in Cicero (most ancient Trismegistus material is from the early centuries AD) corroborate the view that Thrice-Great Hermes originated in Hellenistic Egypt through syncretism between Greek and Egyptian gods (the Hermetica refer most often to Thoth and Amun). 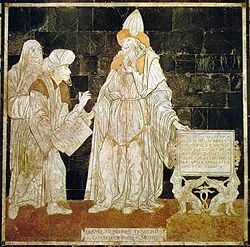 As a divine source of wisdom, Hermes Trismegistus was credited with tens of thousands of highly esteemed writings, which were reputed to be of immense antiquity. Clement of Alexandria was under the impression that the Egyptians had forty-two sacred writings by Hermes, writings that detailed the training of Egyptian priests. 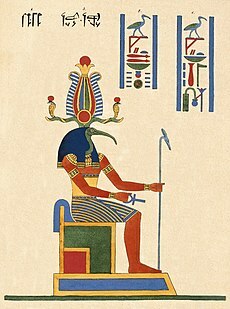 Siegfried Morenz has suggested, in Egyptian Religion: "The reference to Thoth's authorship... is based on ancient tradition; the figure forty-two probably stems from the number of Egyptian nomes, and thus conveys the notion of completeness." The neoplatonic writers took up Clement's "forty-two essential texts". Fowden asserts that the first datable occurrences of the epithet "thrice great" are in the Legatio of Athenagoras of Athens and in a fragment from Philo of Byblos, circa AD 64–141. However, in a later work, Copenhaver reports that this epithet is first found in the minutes of a meeting of the council of the Ibis cult, held in 172 BC near Memphis in Egypt. Hart explains that the epithet is derived from an epithet of Thoth found at the Temple of Esna, "Thoth the great, the great, the great." The date of Hermes Trismegistus's sojourn in Egypt during his last incarnation is not now known, but it has been fixed at the early days of the oldest dynasties of Egypt, long before the days of Moses. Some authorities regard him as a contemporary of Abraham, and claim that Abraham acquired a portion of his mystical knowledge from Hermes himself (Kybalion). Many Christian writers, including Lactantius, Augustine, Giordano Bruno, Marsilio Ficino, Campanella, and Giovanni Pico della Mirandola, considered Hermes Trismegistus to be a wise pagan prophet who foresaw the coming of Christianity. They believed in the existence of a prisca theologia, a single, true theology that threads through all religions. It was given by God to man in antiquity and passed through a series of prophets, which included Zoroaster and Plato. In order to demonstrate the verity of the prisca theologia, Christians appropriated the Hermetic teachings for their own purposes. By this account, Hermes Trismegistus was either a contemporary of Moses, or the third in a line of men named Hermes, i.e. Enoch, Noah, and the Egyptian priest king who is known to us as Hermes Trismegistus on account of being the greatest priest, philosopher, and king. This last account of how Hermes Trismegistus received that epithet is derived from statements in the Emerald Tablet of Hermes Trismegistus, that he knows the three parts of the wisdom of the whole universe. ... they were certainly not written in remotest antiquity by an all wise Egyptian priest, as the Renaissance believed, but by various unknown authors, all probably Greeks, and they contain popular Greek philosophy of the period, a mixture of Platonism and Stoicism, combined with some Jewish and probably some Persian influences. The classical scholar Isaac Casaubon, in De rebus sacris et ecclesiasticis exercitationes XVI (1614), showed, through an analysis of the Greek language used in the texts, that those texts believed to be of ancient origin were in fact much more recent: most of the philosophical Corpus Hermeticum can be dated to around AD 300. However, the 17th century scholar Ralph Cudworth argued that Casaubon's allegation of forgery could only be applied to three of the seventeen treatises contained within the Corpus Hermeticum. Sayyid Ahmed Amiruddin has pointed out that early Christian and Islamic traditions call Hermes Trismegistus the builder of the Pyramids of Giza and has a major place in Islamic tradition. He writes, "Hermes Trismegistus is mentioned in the Quran in verse 19:56-57: 'Mention, in the Book, Idris, that he was truthful, a prophet. We took him up to a high place'". 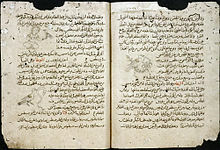 The Jabirian corpus contains the oldest documented source for the Emerald Tablet of Hermes Trismegistus, translated by Jābir ibn Hayyān (Geber) for the Hashemite Caliph of Baghdad Harun al-Rashid the Abbasid. Jābir ibn Hayyān, a Shiite, identified as Jābir al-Sufi, was a student of Ja'far al-Sadiq, Husayn ibn 'Ali's great grandson. Thus, for the Abbasid's and the Alid's, the writings of Hermes Trismegistus were considered sacred, as an inheritance from the Ahl al-Bayt and the Prophets. These writings were recorded by the Ikhwan al-Safa, and subsequently translated from Arabic into Persian, Turkish, Hebrew, Russian, and English. In these writings, Hermes Trismegistus is identified as Idris, the infallible Prophet who traveled to outer space from Egypt, and to heaven, whence he brought back a cache of objects from the Eden of Adam and the Black Stone from where he landed on earth in India. According to ancient Arab genealogists, the Prophet Muhammad, who is also believed to have traveled to the heavens on the night of Isra and Mi'raj, is a direct descendant of Hermes Trismegistus. Ibn Kathir said, "As for Idris... He is in the genealogical chain of the Prophet Muhammad, except according to one genealogist... Ibn Ishaq says he was the first who wrote with the Pen. There was a span of 380 years between him and the life of Adam. Many of the scholars allege that he was the first to speak about this, and they call him Thrice-Great Hermes [Hermes Trismegistus]". Ahmad al-Buni considered himself a follower of the hermetic teachings; and his contemporary Ibn Arabi mentioned Hermes Trismegistus in his writings. The Futūḥāt al-Makkiyya of Ibn Arabi speaks of Hermes's travels to "vast cities (outside earth), possessing technologies far superior then ours" and meeting with the Twelfth Imam, the Ninth (generation) from the Third (al-Husayn the third Imam) (referring here to the Masters of Wisdom from the Emerald Tablet), who also ascended to the heavens, and is still alive like his ancestor Hermes Trismegistus". ^ Budge, E.A. Wallis (1904). The Gods of the Egyptians Vol. 1. pp. 414–5. ^ Bailey, Donald, "Classical Architecture" in Riggs, Christina (ed. ), The Oxford Handbook of Roman Egypt (Oxford University Press, 2012), p. 192. ^ Artmann, Benno (22 November 2005). "About the Cover: The Mathematical Conquest of the Third Dimension" (PDF). Bulletin (New Series) of the American Mathematical Society. 43 (2): 231. Retrieved 7 August 2016. ^ Thoth or the Hermes of Egypt: A Study of Some Aspects of Theological Thought in Ancient Egypt, p.166–168, Patrick Boylan, Oxford University Press, 1922. ^ "Heroes and HERO cults I | V(otum) S(olvit) L(ibens) M(erito)". Dismanibus156.wordpress.com. 2008-05-14. Retrieved 2015-06-25. ^ "Cicero: De Natura Deorum III". Thelatinlibrary.com. Retrieved 2015-06-25. ^ "Stages of Ascension in Hermetic Rebirth". Esoteric.msu.edu. Retrieved 2015-06-25. ^ Copenhaver, B. P., "Hermetica", Cambridge University Press, Cambridge, 1992, p xiv. ^ Heiser, James D. (2011). Prisci Theologi and the Hermetic Reformation in the Fifteenth Century (1st ed.). Malone, Tex. : Repristination Press. ISBN 978-1-4610-9382-4. ^ Jafar, Imad (2015). "Enoch in the Islamic Tradition". Sacred Web: A Journal of Tradition and Modernity. XXXVI. ^ Cudworth, Ralph - The True Intellectual System of the Universe. First American Edition by Thomas Birch, 1837. Available at Googlebooks. ^ "The Tombs of Prophets Seth and Idris: The Great Pyramids of Giza". Sayyid Amiruddin. 2013-01-02. Retrieved 2018-03-19. ^ "Sayyid A. Amiruddin | An Authorized Khalifah of H.E Mawlana Shaykh Nazim Adil al-Haqqani". Ahmedamiruddin.wordpress.com. Retrieved 2015-06-25. ^ Stapleton, H.E. ; R.F. Azo & M.H. Husein (1927). Chemistry in Iraq and Persia in the Tenth Century AD: Memoirs of the Asiatic Society of Bengal, Volume 8. Calcutta: Asiatic Society of Bengal. pp. 398–403. ^ Kevin Van Bladel, The Arabic Hermes. From pagan sage to prophet of science, Oxford University Press, 2009, p. 168 "Abu Mas'har’s biography of Hermes, written approximately between 840 and 860, would establish it as common knowledge." ^ "Hermes Trismegistus and Apollonius of Tyana in the Writings of Bahá'u'lláh". Bahai-library.com. Retrieved 2015-06-25. ^ Clive,, Prince,. The forbidden universe. ISBN 9781472124784. OCLC 952966194. ^ Initiates., Three (c. 2000). The kybalion : a study of the hermetic philosophy of ancient Egypt and Greece. Yogi Publication Society, Masonic Temple. ISBN 9780911662252. OCLC 48179182. ^ a b Jackson, Samuel Macauley (2017). Concise Dictionary of Religious Knowledge and Gazetteer. Classic Reprint Series. Forgotten Books. ISBN 9781334944413. OCLC 984110903.